The much awaited Group.A. 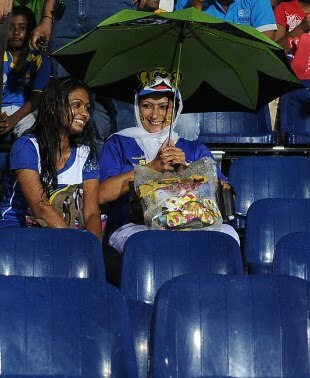 match between Sri Lanka and Australia, was washed out with out any result. The start of the match gave no clue of the storm to follow. Sri Lanka won the toss and elected to bat. Sangakara 73 0f 102 and Samaraweera 34 of 48 were going steadily at 146 for 3 in 32, when the heavens opened out. Further play was ruled out and the teams shared a point each. Nothing much to write about on the match, but the dramas were in plenty in the middle. When it comes to winning, the Australians try all unfathomable means . As the match started and Tait bowling to Dilshan, the drama resembling a WWE wrestling contest was enacted. It is high time the men yellow , captain included are handled properly for their deeds/misdeeds in the field. Tait's language, clear on the screen for any person with a normal sense of lip reading, was unprintable. Ponting did not wish to lag behind and added his bit. It is not that Dilshan is a saint. But the provocation was clearly Australian. Dilshan did not use his brains. He should have stood ground and thrashed the opposition all round, with sensible batting. No replays for washed out matches, is provided at this stage of the competition. The final sufferers are again the gullible public and TV audience world over. What a pity ?? australians in general & ponting in particular have always been getting away. Why so?